1. What Are The Biblical Requirements for Salvation? For centuries men and women have posed the question, “What must I do to be saved?” “What Are The Biblical Requirements for Salvation?” The church has provided these hungry people with a multitude of answers. This seemingly endless group of answers to this simple question has led to much confusion and disagreement over the years. But the source of the answer, the truth and authoritative source has remained the same. In order to know the truth, in order to answer their question we must look to the word of God, the Bible. One must first believe that the contents of the Bible are wholly-inspired (written under the direction and approval of God). This core belief is the foundation and principle of Christian based faith; and recognizes the Bible as the guided source of what we know of God and His dealings with men. The Bible emphasizes the need to look to the scriptures themselves for our guidance. It is the authoritative doctrine for all of God’s people. 2. Once Saved Always Saved Or Can I Lose The Holy Ghost? When we give the newly repented individual the expectation that they will be sin free, problem free, and that the Holy Spirit will make them do right or good when they receive the gift we are giving them an unrealistic expectation and it is an incorrect teaching. Imagine how disappointed the new saint will be to find out they must still face and overcome temptation. Can I Lose The Holy Ghost After Receiving It? Yes, it is very possible for a believer to lose the Holy Ghost (The Spirit of God) after having received it. “Once saved always saved” is a dangerous and very misleading statement, and if you are not careful that belief will take you straight to hell. Although it sounds real good it is non-biblical. Furthermore, there is an “obedience” factor that exists and you cannot get around it. The Holy Ghost is a gift from God given to those who are obedient to the will of God and his plan of salvation. (Acts 5:32) and (Matthew 17:5; Acts 2:37-38). This gift is promised to those who have truly repented and accept Jesus as their Lord and Savior. 3. Is Speaking In Tongues Required for Salvation? Another area that has been a source of conflict for many Charismatic Christians, especially those of us who are brought up under the Apostolic/Pentecostal banner, is this issue of speaking in tongues. So Is Speaking In Tongues Required for Salvation? Some believers have adopted the thought that speaking in tongues represents salvation; it doesn’t. Because of this incorrect assessment, it has led many God fearing people to question their own salvation, wondering if they were filled with the Holy Spirit because they did not hear themselves speak in tongues. NOTE: The Bible does NOT state that there are three requirements (repent, be baptize, and speak in tongues) before one can receive this “gift” of the Holy Ghost (some non-biblical person added that requirement for you). Although there are those of us who have repented, accepted Jesus as our Lord and Savior, received water baptism and have the personal experience of speaking in tongues, which is something that has and continues to occur for some (See: Not Everyone Speaks In Tongues) and for some this phenomenon occurs more frequently (1 Corinthians 14:18), the act of “speaking in tongues” however does not prevent anyone from sinning nor does it guarantee you deliverance from hell or everlasting life in heaven with God. Speaking in tongues is just one of many spiritual gifting’s, but it is certainly not evidence that you now have obtained permanent eternal life (salvation) status with God. Why? Because of the “obedience” factor that exists and you can not get around it. The evidence that we have God’s Holy Spirit (The Holy Ghost) is demonstrated (made manifest) by the fruit we bear, the life we live (Matthew 7:18-23). It is important that you understand the difference between speaking in tongues (a spiritual gift) and salvation; the gifts and calling of God are given without repentance (Romans 11:29), salvation (the gift of eternal life) however requires repentance and a continual walk with and in the will of God. Ministries who teach/preach that an “initial sign” of speaking in tongues is mandatory in order to prove you have received the Holy Ghost, when asked, have no actual biblical scripture to support their claim. We as Pentecostals basically claimed that there are two different types of tongues with different purposes; (I can speak on this fact being that I am of the Apostolic background). Most Pentecostals claim that there are “tongues” which evidences the “initial sign” of the Holy Ghost (which occurs after the repentance and baptism) but allegedly differ from the “gifts” of tongues, which are seen as “spiritual” gifts mentioned in the book of (1 Corinthians 12:1-11). It is this contention that is of great importance. This claim that there are two types of tongues (the “initial sign” and the “gift of” tongues) being the justification for mandating the requirement to speak in tongues is the crux of their error. NOTE: Most Christians do not deny prophesy as being a spiritual gift, however they fall short trying to justify several inconsistencies. The second problem is trying to explain the (Acts 19: 5-6) incident which reflects the Holy Spirit manifesting the “initial” evidence of dual signs (gifts) upon the people. They try to justify tongues as mandatory because it is referenced in more than one instance. They therefore claim it as an “initial sign” requirement yet they cannot recite any scripture that makes such claims or which distinguishes the difference between these two spiritual signs (tongues or prophecy). Both tongues and prophecy are listed as spiritual gifts and if they are gifts then only the Spirit decides who may speak in tongues, as tongues, (being a gift), is not guaranteed to anyone, but as God wills. NOTE: Adding this criterion to the scriptures is manufactured. You will not find the words initial or required associated with tongues in any scripture. 3. No limitation as to whom God could give these gifts to, tongues being one of many listed spiritual gifts, a gift which can be given to someone without repentance or to whom so ever God desires or wills. You will not find “initial sign” or “unknown tongues” associated with salvation in any scripture, these also are man-made practices many have turned into man-made requirements. Note: Jesus did not indicate that his disciples had to teach any recipients how to speak in tongues, and they certainly could NOT teach someone else how to speak in an unknown tongue for as the name implies that which is unknown cannot be taught. In reality many recipients are basically “trained” to make or recite “unintelligible” words in an attempt to equate their murmuring to the “unknown tongues” mentioned in the Bible. Unless someone has the ability to translate babbling, “unintelligible babbling” is not language but random sounds made by the mouth. Telling a new convert they have received the Holy Ghost is a very dangerous practice if it is based on “unintelligible” sounds or words coming forth from someone’s mouth, after being “prompted” by the ministers to speak in this manner. Any ministry claiming the infilling of the Holy Spirit for someone else, other than the recipient himself making that claim, places themselves as well as the church in jeopardy of telling a LIE! (Acts 19:5-6) “On hearing this, they were baptized into the name of the Lord Jesus. When Paul placed his hands on them, the Holy Spirit came on them, and they spoke in tongues and prophesied”. Clearly in (Acts 19:5-6) an “occurrence” is being recalled and recorded in the New Testament (or in the Dead Sea scrolls), yet it is not stated anywhere as being a “requirement“. Similarly, if we hold fast to Biblical occurrences that took place as being requirements; then all Christians professing themselves to be “saved” (especially those of us who are Pastors and said to be called of God) should exhibit all of the following signs (plural) as stated by Jesus, as the “initial” evidence of being “saved” (which is commonly referred to as being filled with the Holy Ghost). (Mark 16:16-18)“He that believeth and is baptized shall be saved; but he that believeth not shall be damned. And these signs shall follow them that believe; In my name shall they cast out devils; they shall speak with new tongues; They shall take up serpents; and if they drink any deadly thing, it shall not hurt them; they shall lay hands on the sick, and they shall recover”. I know of no one exhibiting all of these signs, verifying that they have all of these listed God given abilities. If there is to be any “initial” sign requirements in determining who is “saved”, or who is not, then this is clearly the scripture to focus on. This should be the foundation of any test, as Christ himself has clearly indicated, “these signs (PLURAL) shall follow them”. DO YOU EXHIBIT ALL OF THESE SIGNS? DO YOU KNOW ANYONE WHO DOES? I cannot remember the last time I saw a “saved” Christian picking up a rattle snake or drinking a cup of poison to “confirm” that he/she was saved. OK maybe that would be a little too extreme for most of us? Well tell me then when do individuals (like yourself) start exhibiting the evidence of your ability to heal by the “laying on of our hands”? I am sure that we all know many seriously ill people. I cannot remember the last time I saw any “saved” Christian or Pastor eagerly and honestly with assured confidence profess to be able to lay hands on any randomly chosen sick individual and claim healing or deliverance from a deadly disease, sickness or terminal illness (indicating one of the undisputed signs of being saved). I personally don’t remember any who openly declared a specific time when that healing would take place, “immediately” or “let’s just keep our fingers crossed”, and pray that God heals them”. Of course, we all know that God is the only one who can heal, but it is indicated that God has given all of those who are “saved” his approval, his authority and the ability to heal by the means of laying on of hands. This is scripture. You see it is quite easy to claim to speak with “new tongues” or “unknown tongues” (which is an ambiguous sign) easily generating “unintelligible vocal activity” or “unintelligible babbling” claiming it to be a “Heavenly language” (for lack of better wording). Those who cling to this justification may only be adhering to this sign as it is clearly the easiest one to “fake”, anybody can be taught to mimic unintelligible vocal activity. It is undoubtedly harder to fake the rest of the God given evidentiary Biblical signs of being saved. It is not surprising that we tend to avoid claiming “ALL” of these signs as “joint” requirements . Why, because this was not an actual commandment here, neither were the other passages as mentioned earlier, but it is nonetheless undisputed that along with the sign of “tongues” Jesus also indicated there were several other signs which were all part of the EVIDENCE of a TRUE BELIEVER, ONE WHO IS SAVED! As with the sign of speaking in tongues, just because something is mentioned which occurred, or could occur, does not necessarily make it the exhaustive (complete) listing or a combined list of all requirements that must all be obtained unless the Bible specifically states it as such. Now we have a context interpretation decision, either these signs evidenced what “could” take place as God so chooses to gift an individual or all of these signs must occur at the same time in order to fulfill the listed requirement Jesus identified. Remembering the word initial is not used in any of these passages of scripture, as it is often said “we can’t take part of the word and omit the parts we don’t want to practice” The whole picture has to fit in the most harmonious and logical manner. If we are looking for evidence of the Holy Ghost, it seems that we need a larger arena to be surveyed or a reevaluation of our logic. Although these miracles occurred at that time, these attributes may come about later or be developed over the course of time, (spiritual growth and gifts, some being faster than others considering those who are babes in Christ). If Tongues Are Mandatory; Are Infants Who Die Doomed? If the Holy Ghost must make “EVERYONE” speak in tongues as the condition to enter heaven (or be “saved”) then if this were true all infants who die premature would be doomed. Thankfully we know this teaching has little merit. First, we know God is just. Second, Jesus was born a human infant, whom we say was also “totally man” (Hebrews 2:14, 17) and the seed of David (Romans 1:3-4) so let’s test this man-made theory further. The Bible says that Jesus was without sin (2 Corinthians 5:21; 1 John 3:5). How could He have been without sin if babies “inherit” the guilt of Adam’s sin and if Jesus was indeed a real “human being” (not just the outward appearance of a human) and the true blood offspring (descendant) of David who was also a descendant of Adam (both who were sinners)? If a baby is guilty of sin, what happens if it dies before it is baptized or speaks in tongues, or if its parents refuse to baptize it? If babies were guilty of sin, if one dies without baptism or speaking in tongues, then wouldn’t it follow that it would be eternally lost? Almost no one will accept this conclusion, yet to deny the conclusion is to admit that babies really are not guilty of sin. Furthermore, if speaking in tongues is essential to salvation, if a baby is a sinner, then its salvation from sin must depend entirely on the actions of others and God to allow it to reach an age of understanding. It must rely entirely on its parents to choose to baptize it. It has no choice in the matter, and cannot possibly influence its own destiny. This contradicts all the scriptures quoted showing that salvation is a matter of individual choice (2 Corinthians 5:10; etc.). Since salvation is a matter of individual choice, and since a baby cannot confess its belief in Christ, cannot repent of its sins if it had any and cannot choose or express a choice to be baptized, even if it wanted to, we can conclude that a baby is not lost to begin with. Therefore it does not need baptism nor must it speak in tongues. Acts 10:47 and John 3:5 refer to “men” (adults) not children; “Can any man forbid water” and “except a man is born of the water”. There is no indication that these words were ever intended to be applied to a new born child (nor are there any examples of such) but this was written to men and women who had a level of “understanding” and comprehension, not infants. The Born Again Experience (Born Of The Spirit), Of Which Christ Speaks Of. The Conversion: Which refers to a process that is ongoing within an individual (Romans 12:2). It is a lifelong-transforming process overcoming sin, growing in grace and in the knowledge of God and His Christ (John 5:23, Col 3:1-4, 10) (2 Peter 3:18, 1John 2:24, Rev 12:10). In the book of John (chapter 3) we find Jesus using several new and interesting expressions; “Born of Water”, “Born of the Spirit” and “Born Again.” In the opening passages (John 3:1-2) we have Jesus talking to a man named Nicodemus, who was a ruler of the Jews, a member of the Sanhedrin. Jesus revealed to this devout Pharisee that the Kingdom of God was for the whole world (John 3:16), not just the Jews and that Nicodemus wouldn’t be a part of it unless he was personally born again (John 3:5). This was a revolutionary concept, its entrance requirements were being born of water and of the Spirit. Jesus also tells us that God’s Kingdom had already begun in the hearts of believers (Luke 17:21, Mat 12:28). When Jesus tells Nicodemus that he must be “born again” he is actually speaking of obtaining a totally different new body and life literally, or the transition into a new creature that has been given eternal life, although it encapsulates a figurative birth process. 1. The starting point in our new life (as a Christian). 2. The new starting point in our growth, as babes in Christ. 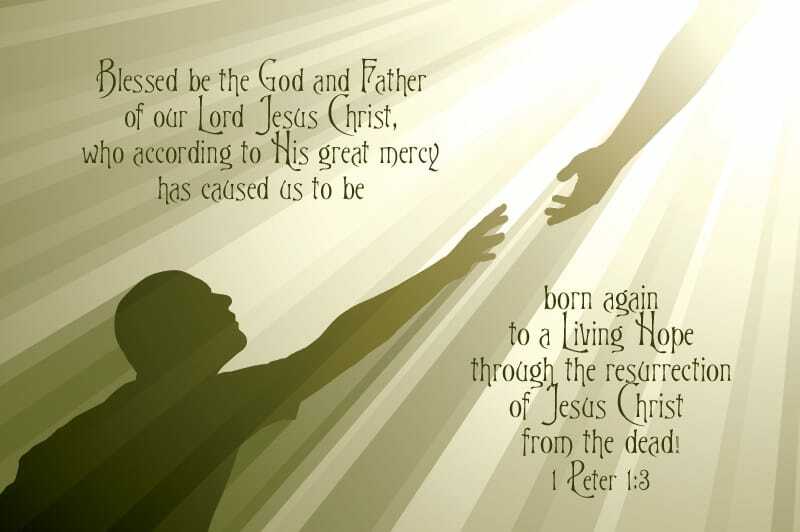 Although not directly stated as such, various passages suggest (or imply) that the point in which a “sinner” becomes converted that sinner has been “born again.” The Bible implies that we are “born again” when we begin a new life in Christ (in other words we, “like as Christ”, ought walk in a “newness” of life – Romans 6:4, 7:6, 2Cor 5:17, Eph 4:22-24, Col 3:10, 1John 2:6) and as with any “earthly” birth there is a growth process. This is also why some are often referred to as being babes in Christ, and newborns (as desiring the sincere milk) who have to be taught the Word of God (1 Corinthians 3:1-2; 1 Peter 2:2) just as Jesus was taught by his Father (John 8:28-31). Even though your heart may be right for receiving the Holy Ghost we still have to be taught the “Will of God” or “Word of God” somehow or from someone (Hebrews 5:8; John 5:19-20, 8:28, 14:26; 1 John 2:27; 2 Timothy 2:15; Acts 17:11-12). When we receive the Holy Ghost (the Spirit of God) and are led by his Spirit we are classified as “sons of God” (Romans 8:14) which is of course only figuratively because we have not yet truly been “Born Again” (literally). To make matters somewhat more perplex, in (John 3:5) we see two different birth processes emerging, a man must be born of water and of the Spirit. Both are symbolically similar (in reference to being born) in that they both symbolize the beginning of a new life. But the phrase to be “born of water” is often debated as to its true meaning. Some argue it refers to the birth as given by a woman, others say that it refers to water baptism. We must also understand that the commandment to be baptized with water was (and is) only applicable to certain groups of people. For example, as for the Old Testament (O.T.) Saints, water baptism and the belief in Jesus was not a requirement given them by God, these individuals are now dead (or “asleep”). Many of these “obedient saints” of God (often referred to as “holy” or “righteous“) will be saved without ever receiving water baptism (Heb 11:13-16 (NIV); Heb 9:15 (NASB): Rom 4:3-6 (NASB), Rom 4:10-11(NIV), Rom 4:22-24 (NIV); James 2:23: Ps 32:5). Many O.T. men and women of God had the Holy Spirit (Psa 51:11), various gifting, callings and blessings without ever receiving water baptism ( 5. The Holy Ghost Was Not Unique To Pentecost ). The same occurred with John and others in the N.T. (Luke 1:15-17, 41, 67, 2:25-38; Heb 11:13-16). Men have received the Holy Spirit before water baptism (Acts 9:17, 10:44-48; 15:7-8) and some in Christ’s ministry were forgiven without water baptism (Mt. 9:1-7; Luke 7:48). Water baptism serves as both a symbolic “figure” (1 Pet. 3:21) and as a “witness” (1Jn 5:9-10). However, it is not necessarily essential to everyone’s salvation but applies to those who have heard the gospel (Rom 10:14). God is not going to throw anyone in Hell for commandments they were never afforded the opportunity to receive. Knowing that God is a just God (Rev 15:3), this understanding would also apply to other similarly situated groups of individuals, infants, mentally disabled, unlearned, etc.. (Ref: Should Babies Be Baptized? ) nonetheless, everyone will stand before the judgment seat of Christ to give an account (2 Cor 5:10), but not because they failed to be water baptized. This is an important point to take note. Jesus statement clearly indicates that being “Born of Water” was a prerequisite with no exceptions (John 3:5). Water baptism is important to everyone who has heard the gospel of Christ yet it clearly is not applicable to every single person who ever lived here on earth, especially when we consider the Old Testament Saints (Mat 8:11). We, therefore, can conclude that the phrase “Born of Water” does not mean that all men must receive water baptism in order to enter Heaven. The born of water symbolism can, however, be seen directly relating to the physical birth of man. Life comes through both the water and by the breath of God; an infant comes through (or develops within) the water of flesh and when birthed breathes air by the breath that is given it from God (Isa 42:5). A new baby must go through the process of growing, learning, and maturing as does a new man in Christ. One of the signs of a woman getting ready to give birth is what we commonly call the passing of water. Note: Flesh is flesh—that is what it is. Jesus spoke this in the literal sense. Since the second part of the sentence is dependent upon the first part, it too must be taken in a literal sense. Spirit is spirit —that is what it is. Verse 6 is parallel with verse 5. Water is equated with (flesh) physical birth. Whereas, Spirit is equated with spiritual birth. So what Jesus is saying is that you must not only be born physically but spiritually. Jesus was telling Nicodemus that he could not enter the Kingdom of God while still in that state. As Paul said, “Flesh and blood cannot inherit the kingdom of God” (1 Corinthians 15:50). Let’s review again how men (humans) are first given life (born). 2. The Bible, however, indicates that this is distinguishable from that which is required for man (dead or living) to enter into the kingdom of God. This is accomplished by a process called Born Again (John 3:7), the question is how? Nicodemus’ question was legitimate, it was impossible for a man to re-enter his mother’s womb and be reborn. However, Jesus was not asking him to do the impossible but to see that he had a real spiritual life to consider, not just a reformed old life. (1Co 15:49) And as we have borne the image of the earthy, we shall also bear the image of the heavenly. To fully understand the true meaning of being born again, we first have to understand the true meaning of Jesus being the “firstborn” among many brethren. Yet we know that this is not speaking of Jesus’ first birth, his human birth at Bethlehem. It is speaking after He was physically born of the Virgin Mary—because many brethren were born (of human birth) before Jesus. Since Jesus is the firstborn of many brethren, these many brethren are to be born having the same kind of birth experience as Christ. When Jesus was “born” at Bethlehem, he was a human, – born the Son of man (woman). When Was Christ Born Again? The Bible says we, (being sons of God), will one day be like Christ (not like God) when he appears (1 John 3:2, Col 3:4, Heb 9:28, Php 3:21) – and joint heirs with Christ (Romans 8:17). In order to be born again, our fleshly body must first somehow DIE or, as we know it, cease from existing as a functioning/breathing human being. Only then could a man be literally born again! * Note: Yes, there will be some “Holy Ghost filled” men and women still alive when Christ returns during this first resurrection, and they will also be caught up to meet Christ in the air (1Th 4:16-17). In either scenario, their physical flesh body will die (Jas 2:26) and they will be changed/transformed with new bodies (1 Cor 15:52-53). These scriptures (Rom 1:3-4, 8:28-29) are referencing the TWO births of Jesus Christ. The one through the Virgin Mary, a descendant of David, by which He became the Son of man. Then later, He was born again, (by God) but this time by His resurrection from the dead! Note: When we consider (John 1:13, 1Peter 1:3, 1John 5:1), we should take note that these three passages contain three different English words (Begat, Begotten, and Born) which are all English words transliterated from the same Greek word (G1080). However, the intent and usage of these words are vitally important to understand. It is true, no one will be born again (of God) unless he repents of his sin, believes on Christ and accepts Him as personal Savior, receives the gift of the Holy Spirit, and then is led by the Spirit of God. 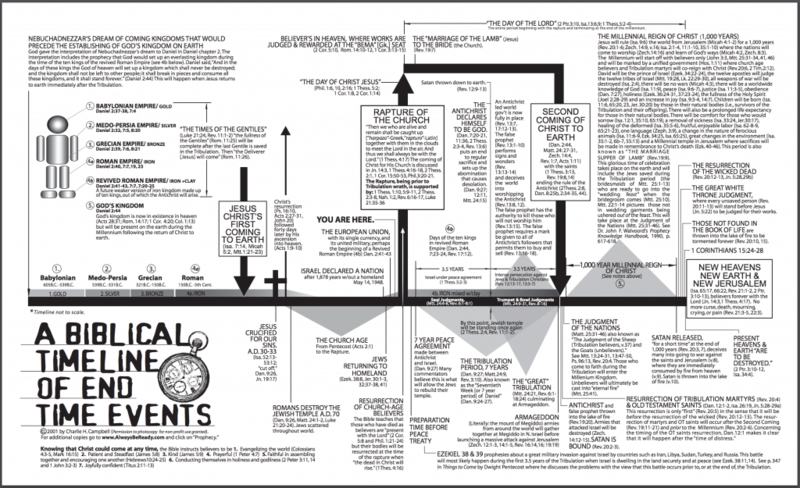 But this experience is not a true “born-again” experience — it is a begettal! It is NOT a true Birth! We have not literally been born again if we have not yet literally died because as long as we remain physically alive we still possess our sinful nature (free will/ the ability to chose sin) which is an inherent part of our physical nature. Each of us was begotten in our mother’s womb before we were later born. In (1 Cor. 1:2) Paul addresses his letter to Corinthians: “Unto the church of God … to them that are sanctified in Christ Jesus, called to be saints“. And in verse 10, “Now I beseech you, brethren…” The brethren are those who are the saints. Christ is the firstfruits — Christ the firstborn of many brethren — the first to be born by the resurrection from the dead! (1Cor 15:20-23). The Bible does not say that Christ was a sinner who needed salvation. Yet he had to be born again, just as all saints (brethren) in order to be the FIRST! The Biblical term “born” or “birth” is used, not only to indicate a child coming forth from the womb of a woman but it is also used to describe the source of a beginning of a thing, an event, or series of events. For example, we speak of the birth of a nation, an institution, or a concept. As it was with Christ, the essential component to experience being born again (to experience the FIRST resurrection) occurs only with those who have been “quickened” (1Cor 15:45). Whether we call ourselves brethren, saints or a child of God, one thing is made clear in (Romans 8:14,16) – if God’s Spirit is in us, leading us, we are sons (children) of God. And if children then heirs of God. However, we are not yet inheritors — but rather we are heirs waiting to inherit. “If” we suffer (endure) with Christ we will literally be “joint-heirs” with Christ (born again by God in the resurrection), and the “glory” Christ has we too shall receive, for we (as children of God) will also be glorified together with Him (Christ) (Romans 8:17). This verse is clearly telling us by “whose authority” (Jesus) this act or demonstration of power was being conducted under (the command to rise and walk). It demonstrated the power [authority] given to Peter [as a follower of] through Jesus Christ to work miracles through the indwelling of the Holy Ghost/the Spirit of God (Acts 1:8; Romans 15:19). Then Peter said,.… In the name of [by the authority] of Jesus Christ Nazareth rise up and walk. Even today an officer of the law may call out to an escaping criminal: “Stop, in the name of the law.” He is giving notice to the criminal that he has the authority given him by law by which the criminal is to comply to his command to stop. NOTE: This is also the same context used by Jesus (below) when he said “I come in my Father’s name” and “the works that I do in my Father’s name“. “Faith” (believing in the operating authority behind the name); and “works” (evidence – James 2:14, 17, 18). How we understand this passage actually depends on how we determine who is doing the speaking in verse 13. These are either the words of Christ or the words of John, who is the actual writer and narrator telling the story. Then according to Jesus, no man (John 3:13) (or no human) has ever entered into heaven…. “except” – let’s just analyze this small portion of writing first and the exception. There are several important facts to take away from this passage John 3:13. 1. Jesus is clearly and specifically speaking about humans only (“no man”); identifying which humans, if any, have or have not entered into heaven itself. 2. If we say this was Jesus speaking, Jesus is specifically proclaiming to be the ONLY man (the only human/the son of man), who has ever “ascended up” to heaven. 3. Although many are tempted to make an incorrect assertion, notably, this same passage does not (nor does any other scripture passage) reflect Jesus as proclaiming himself to be God: “but he, the “son of man” (the son of a human). Note 1. We know from scripture that fleshly humans did not (nor could they) literally exist in heaven prior to being a created being here on earth. If Jesus had existed in heaven prior to Bethlehem he certainly did not exist as the fleshly human son of David or Mary prior to his parents being created or birthed themselves. Jesus did not have a fleshly human father or mother who contributed to his birth up in heaven such that would make him a son of man (only in the thought/mind of God). (1 Corinthians 15:50) “Now this I say, brethren, that flesh and blood cannot inherit the kingdom of God; neither doth corruption inherit incorruption“. Note 2. In this passage, the reference to “who came down from heaven” is arguably a matter of interpretation. It is better argued and supported that this is in reference to the fact the Jesus came from God (from heaven), that means we can substitute this phrase and replace it with “from God.” There are many scriptures that will prove this but I will provide just a few. * (There is a clear distinction between God (the one that gave) and God’s Son (the one who received)). Note 3. The reference to “the Son of Man who is in heaven” is also another example where there is variation in some of the “original manuscripts;” some contain this section as worded in bold italic underlined others do not. (Remember, we have known variations that exist in some of the original manuscripts discovered. Therefore, we must always be mindful that not every translation will necessarily be the same nor does it mean the translation used is the correct one!) Although some argue that this indicates Jesus was actually God, unfortunately, Jesus is speaking here and he is not proclaiming himself to be God but rather he is professing himself to be “a man” (the Son of Man who is in heaven). By faith Enoch was translated that he should not see death; and was not found, because God had translated him (Hebrews 11:5). It should be noted that the Scriptures do not record the specific place to which Enoch was taken–only that he was taken. The word heaven, however, is used to refer to different things, namely the sky, the domain of the stars, and the dwelling place of God. It, therefore, goes to reason that Elijah was somehow carried up (arose) into the sky by an act of God, but there is nothing that would indicate he went to the Heavenly dwelling place of God. Notice the word till in that verse. This means the dead will not, or cannot awaken until the “last day,” as Martha calls it when she is speaking of Lazarus (John 11:23-24). Keep in mind this verse is penned “AFTER” the death and resurrection and ascension of our Lord Jesus Christ. Many preach that everyone that was in the graves is in Heaven after the resurrection of Christ because they think He brought them all out of (Hell) when He was dead. Yet, this verse proves that they are indeed in error. Peter made it plain that the passage they were questioning (which was Psalm 16:10) in regards to the Lord not allowing His soul to stay in hell or His body to rot. The passage was indeed speaking of Jesus Christ ascending to Heaven, not David. For it is also explained in this same chapter of Acts. (1Corinthians 15:20-23) “But now is Christ risen from the dead, [and] become the firstfruits of them that slept. For since by man [came] death, by man [came] also the resurrection of the dead. For as in Adam all die, even so in Christ shall all be made alive. But every man in his own order: Christ the firstfruits; afterward they that are Christ’s at his coming. It is not until Jesus MAKES us immortal on that last day will we be able to “get out” of the grave on that day. There is another line of thinking debated among some scholars. So I think it is worth mentioning. This belief is based on the understanding that John 3:13 is not indicating that Jesus was on earth and in heaven at the same time, but rather that Jesus did not speak the words recorded in John 3:13. Jesus stops speaking in verse 12 and the narrative starts with verse 13. The Companion Bible by Bullinger has notes that make a good case for the fact that Jesus’ speaking ends at verse 12 and John, the narrator, begins with verse 13. In fact, Bullinger lists seven different reasons for Jesus’ talking ending at verse thirteen. 1. Because the past tense of the Greek verbs that follow verse twelve indicate completed events. 2. Because the expression “only begotten Son” is not used by the Lord of himself, but is used by John describing the Lord (John 1:14, 18, 3:16, 18; 1 John 4:9). 3. Because “in the name of” (John 3:18, using the Greek word en) is not used by the Lord, but by John (John 1:12; 2:23; 1 John 5:13). 4. Because to “do the truth” occurs elsewhere only in 1 John 1:6. 5. Because “who is in heaven” (v. 13) points to the fact that the Lord had already ascended at the time John wrote. 6. Because the word “lifted up” refers both to the sufferings (John 3:14; 8:28; 12:32, 34) and to “the glory which should follow” (John 8:28; 12:32; Acts 2:33; 5:31). 7. Because the break at verse 13 accords best with the context, as shown by the structure of the section. Strong and straightforward evidence that Jesus is not speaking after verse 12 comes from just reading the verses in the Greek (and sometimes even the English) and paying attention to the verbs and the content of the verses. For example, verse 13 is very clear: “No one has ascended into heaven…except the Son of Man.” The verb “ascended” is in the past tense in both Greek and English, and shows us that Jesus had already ascended to heaven when this verse was written. This is confirmed by the last phrase of the verse, which says that Jesus “is” in heaven. The phrase, “which is in heaven,” has all the evidence of being original, and should appear in English Bibles as it does in the King James Version. The verbs in verse 16 continue to show that Jesus’ death is in the past and that Jesus was not talking to Nicodemus but rather that verse 16 is the narrative of John (at this point many commentators agree, including the translators of the 2011 NIV, whose red letters stop with verse 15). The text clearly says that God “loved” the world and “gave” His Son. These things were already done, not future events. The serpent being “lifted up,” Christ’s being “lifted up,” that God “loved” the world, and that God “gave” His Son—all of these verbs in the aorist tense, and all references to past events. This is why even the English versions say God “gave” His Son instead of “will give” him. When Adam was created in the garden he was created with the gift of choice or what we commonly term “Free Will.” There was no recorded sin in Adam’s life. Prior to his pivotal moment of disobedience to the commandment of God found in (Genesis 2:16), it appears he did not even possess the ability to discern the difference between good and evil. He had free will but did not have the ability to discern both good and evil. It wasn’t until after he had disobeyed that his eyes were opened and he knew he was naked and covered himself. Preceding Adam’s fall, he and his wife were both naked and unashamed. They did not discern nakedness, it was their natural state of being. Once spiritual discernment came into play the freedom Adam and Eve had experienced was altered. Then came the curse of death, the promised consequence of Adam’s disobedience. “In that day thou shalt surely die…” was the promise but abrupt death was not manifest in that moment; but God’s promise was far reaching and it was at that precise moment that death was allowed to reign in the world and become the heritage of all mankind. (Romans 5:12) Wherefore, as by one man sin entered into the world, and death by sin; and so death passed upon all men, for that all have sinned: (also Romans 5:13-17). So, today we have both death and a sinful nature that was inherited from this one act of disobedience and with age, time and study we learn to discern both good and evil. The question many have regards babies and are babies born with sin. (Romans 5:12) states “all have sinned.” If All meant ALL (as to include infants) then babies are born with sin. However, if true that would also mean all of mankind are born with sin, even Jesus Christ would not be exempt, he himself “born” (Matthew 1:16, 2:1; Luke 1:35, 2:11), a “human child” of Mary (Matthew 1:16) and seed of David (John 7:42; Romans 1:3; 2 Timothy 2:8). Yet, the Bible tells us that this man (John 8:40) was without sin (1 Peter 2:22). Is sin actually inherent at the first breath an infant takes into their lungs? Or, does choice play a part; being a point of entry into each life? In Adam’s life sin was nonexistent without that choice. Once that choice was made, then discernment and accountability came into play. When an infant is born they lack the ability to choose anything for themselves, their entire existence depends on the care and nurture of others. It is not until they have the ability to choose to disobey that sin enters the picture. Even then, until they have the ability to discern right from wrong can full accountability come into play? The basic knowledge of right from wrong starts being learned at a very young age. How many people reading this know this scenario? “Don’t touch that, it is hot.” followed by a curious child touching the object and learning what both “don’t touch” and “hot” mean. At this point, did the child sin? Until after the lesson of what “don’t touch” and “hot” means the child does not comprehend that touching the object is wrong. It is with this repetitive lesson. “Don’t touch that…” that the child begins to understand this is an order and they are not supposed to disobey. When the child turns to the parent with a knowing look and an ornery grin and touches the object anyway, they have made a choice and they have disobeyed, they are then accountable and pay a consequence with a swat on a diaper padded bottom, or a moment in time out. Was punishment meant to hurt the child or teach them the serious nature of the infraction? Children are taught in degrees. Choice and disobedience also presents itself in degrees. 8. What Is The Difference Between Sin, Sinful Nature & Sinful Flesh? What Is The Difference Between Sin, Sinful Nature & Sinful Flesh? Many pastors teach their members that all individuals are born into this world as sinners, someone who is doomed to the eternal pits of hell. The meaning of this word “sinned” as used in (Romans 5:12) is actually in reference to man’s “sinful nature.” A “sinful nature” and an act of “sin” have different meanings. To sin is to actually commit some type of sinful act, while to be born with a “sinful nature” is to have a trait that makes you susceptible to becoming a sinner. All infants being born as sinners is argued as fact; however when born babies have committed no act of sin this argument is not supported by the definition of sin as being an act of disobedience or transgression (breaking of God’s law – 1 John 3:4). However, before we come to any conclusion we must also consider every related scripture on this topic in order to be honest with ourselves and adhere to the most harmonious biblical understanding. The following are several verses which must be taken into consideration. (Romans 5:12) “Wherefore, as by one man sin entered into the world, and death by sin; and so death passed upon all men, for that all have sinned: (also Romans 5:13-17). A few verses later however in Romans 5:19 Paul now says “For as by one man’s disobedience many were made sinners.” Paul says many (in contrast to “all”) were made sinners so unless one verse is a “figure of speech” (which it is) they contradict. (Ezekiel 18:20) – “The child does not bear the iniquity of the father, but the wickedness of the wicked is upon himself.”. We, therefore, need to explore how all of these verses best harmonize without being contradictory. In addressing this matter I always like to start by addressing how it relates to infants. How is a baby ever given the opportunity to receive salvation if it is born a sinner and happens to die during infancy? Does it die a sinner? Is it a sinner because of Adam’s sins and yet it cannot even comprehend the concept of faith or belief in Christ? The Bible gives no examples of Christian believing infants? What we do know is that when an infant dies each one will be judged according to what they have done (their deeds – 2 Corinthians 5:10) so we can concede that an infant would have done the least wrong or sin in comparison to any adult who dies regardless if the infant was never baptized, never knew of God or Christ, never spoke in tongues, never even repented for any of the “alleged” sins the infant actually never committed, in thought or through any of its own “physical” actions. What Is The Difference Between Sin And Sinful Nature? Sin is basically any disobedience which goes against the will of God. We are always striving to keep ourselves in right standing with God by observing and following his commandments. Sin is not something condoned by God but sin can be forgiven by God in accordance to the will of God. God’s requirement for the forgiveness of sin in the Old Testament was often by sacrifice. Grain offering (Leviticus 2) of raw or prepared grain, as a memorial or a sign of the worshiper’s faithfulness; and there are probably more examples, etc….. I am not an Old Testament scholar but without question, God has often been found making a way for the consequence of man’s sins to be forgiven (or to avoid God’s punishment). There were many men and women who followed and worshiped God as instructed by God and many of these men were called Holy men or prophets and their stories are recorded. So what happens to all of the Old Testament people like Abraham, Noah, and Job? Are all of these God loving men doomed to the same fate as the sinner who did not serve God? Of course not, if so this would totally vanish the belief that God is a “just rewarder” of them that diligently seek him (Hebrews 11:6). God never told any of these men they would go to hell and burn forever as a consequence for not knowing that there would be a man named Jesus (who had not yet been born) that would be called the Christ or for not knowing and believing that Jesus was the “Son of God” that would come long after they had been dead and buried, or that someone in their future would die for the remission (removal) of their sin(s) or that they should adhere to some future baptism requirement “in the name of Jesus“, or any other requirements or instructions that would be taught by Jesus or shared through the writings of his disciples/apostles. For those who attempt to take select New Testament scriptures out of context pertaining to salvation should be very careful when we claim that these men had to be baptized in Jesus name and speak in “unknown” tongues. Just a little hard to imagine all of these Holy men of God going to hell after doing the will of God as instructed by God. This issue is brought up only because infants would also have this same similar disadvantage of being disconnected from God’s forgiveness if this theory were true. We have been commanded to obey the words of his Son, Jesus Christ our Lord, who was sent by the Father into the world teaching us how all men could obtain a relationship with God our Father, through the belief in and teachings of Jesus (repentance, baptism, etc…). This is also referred to as discipleship. Sinful nature is the ability to commit sin or the desire to want to commit the sin, it is the free will given a man to choose sin or choose to abstain from sin. The Bible gives us plenty examples of various types of sins. This is important but not the primary focus regarding infants and determining if they are born “sinners” destined for hell. What Part Contains The Sinful Nature: The Spirit Or The Flesh? The first order is to determine which part of man is sinful? Sounds easy enough right? Flesh is unanimously determined to be the sinful nature, correct? (Romans 7:17-18, 8:3) But is it really that straightforward? Did Satan and his angels also have a sinful nature (the ability to disobey God)? How? Did they originally have human flesh? Or were they “angels“? It would appear that although Adam and Satan are different types of beings both were created by God and both sinned against (or disobeyed) the will of God. This is only mentioned to bring light to a factor that many tend to overlook in consideration. The Bible indicates that sin is disobedience to God’s will (or transgression of the law), therefore adults have this ability to transgress but do infants actually qualify as sinners when they have committed no disobedience or transgression against the will of God at this stage in their life? So does being born with a sinful nature automatically make every man a sinner? At first thought, many would say yes but clearly, it doesn’t because even after we have become Christians our sinful nature (this free will ability to be disobedient to God) remains with us until death. To be born with a sinful nature is similar to being born into this world with parents who have diabetes. From that point on the disease is said to run in your family; it is an inherited possibility (a risk) but not necessarily a guarantee you will ever have the disease. Your father or mother may have this disease but based on your choices to live healthily you may never develop the disease. But if you make bad choices, you eat a horrible diet, don’t exercise, and pollute your body then you end up with diabetes. So it is with a man and has always been that way. We can prove this here very shortly but I first need to address the “new man” aspect. Some would immediately argue “but we become a new creature in Christ and have put on “the new man” (Ephesians 4:24). Yes that is true but that is also only figuratively speaking, it is new in that we are actively renewing our way of thinking and living daily but our “sinful nature” the minds ability to think of sin is ever present with us for it is the mind that initiates all actions which are listed as being sinful. Was John The Baptist born a sinner? John the Baptist was born “filled” with the Holy Ghost from the womb (Luke 1:15). Was he then born “with” sin? Can a man have the Holy Ghost while yet being a sinner at the moment of his birth? Or was John actually born into sin (a sinful world) being a man having a sinful nature (the ability to sin or disobey God). Did John ever sin? There is no record of John committing sin. For “all have sinned” (Romans 5:12) to be taken “literally” would indicate John sinned somewhere along the line. Was it while he was in the womb? Was it after his birth and after receiving the Holy Ghost? If all are born sinners then John’s situation would indicate that the Holy Ghost doesn’t save anyone from sin if this understanding meant John was born a sinner instead of being born with a sinful nature. This understanding is further supported by the fact that even after receiving the Holy Ghost people fall away, fall back into sin, often turning their back on God. Being filled with the Holy Ghost does not make a person immune to committing sin, but this Holy Spirit (that portion of which we receive of God) leads and guides in the paths of righteousness, the man was inherently made to have “choice” and it remains this way even after receiving the Holy Ghost. Was Jesus born a sinner? For Romans 5:12 (“all have sinned”) to be taken “literally” then Jesus must have sinned also somewhere along the line. The Bible says that Jesus was without sin (Hebrews. 2:14, 17; 2 Corinthians 5:21; 1 John 3:5). How could He have been without sin if babies “inherit” the guilt of Adam’s sin and Jesus was “human” and the offspring of David who also was the descendant of Adam? One argument I was presented with was that Jesus “inherited” his sinless nature from his Father, which sounds good and must be taken into consideration. But what about the sinful nature he also inherited from his mother that too must be included. How could that be excluded when we just determined that it is the flesh (or the desires of the flesh) that gives a man his sinful nature? Both John and Jesus were said to have been born with the Holy Ghost, yet Jesus is not considered a sinner at birth. It dawned on me that maybe we should take a look at Jesus mother Mary. Was Jesus (if he were God) then birthed by a sinner named Mary? If salvation didn’t occur until after the shedding of Jesus blood and his resurrection and if we still claim that everyone is born a sinner “literally” then Jesus (or God Jesus) dwelt inside a sinner for 9 months? As you may start to see a bit of caution may be needed in our hasty interpretations of what is meant by “unclean” or “sinner” or “all have sinned” which may be literally spoken in one verse and used figuratively in another, dependent upon the intent of the writer. What is the starting point when we begin to know of God? One difference not mentioned in 1 Corinthians 15:21 is that Adam was a grown man when God gave him his commandment thus Adam’s mentality or intelligence was developed well enough to be held accountable for disobeying God. Jesus, on the other hand, was an infant when he came into the world. There is nothing in the bible, which would indicate Jesus had any prior abilities or prior conversations with God until after Jesus reached an age higher than infancy mentality. We can reasonably conclude that all children including Jesus had to be taught from someone that which is good from that which is bad (i.e., “you ate my candy, it didn’t belong to you”). Does an infant know all the rules prior to being taught? How do we measure accountability or distinguish doing something wrong vs. being sinful (i.e. stealing)? Is the child’s action actually an act of sin if he is unaware? Luke and James seem to imply that this is not the case with God, indicating that some degree of conscious awareness is required to be considered as committing sin because there must be a sense of fairness to fit the circumstance. The first indication that Jesus had any possible communication with God was after Jesus was of age and able to speak and shared his need to “be about my father’s business” (Luke 2:49), to his mother, clearly a higher degree of mental development had been established. He was now able to speak and share his thoughts as compared to his limited abilities during his infancy. We can also reasonably conclude that Jesus would have been taught by his parents. God, being Jesus father, would have had to convey what God’s will was for Jesus, which Jesus acknowledged took place. John 8:28 gives support showing Jesus was like any other human infant not all knowing but had to be taught. To me, this is important because unless Jesus was a real human who had free will to disobey God and face similar consequences from God there was no “real sacrifice” ever made. If Jesus was controlled by God no real sacrifice was made either however scripture indicates that Jesus death was a voluntary sacrifice. Jesus didn’t really want to die when his time came. If we say that Jesus was actually God then Jesus was not a real man or totally human but God pretending to be a man. Of course, that does too much damage to who and what God is. As Jesus told us from his own mouth, God is a Spirit. Jesus always claimed himself to be a man. No more needs to be said if we claim to believe Jesus. This does not in any way diminish the “unique” relationship God had with Jesus (God’s begotten Son/ the lamb of God, etc..) any more than the special relationship God had with Adam and many other biblical notables mentioned through the Bible in comparison to the rest of humanity. The answer to this question is not actually that difficult or confusing. God has always been our savior (1 Timothy 1:1, 2:3, 4:10), in that God alone created the means whereby man could be saved, that is to say whereby man could, (both before and after the fall of Adam), obtain “eternal life” (Titus 1:2-4). It is however important to understand that it was always God’s plan (will) that Jesus would be the propitiation (Romans 3:25; 1 John 2:2, 4:10), sent forth to shed his blood for our sins (Hebrews 9:22-28) thus becoming the redeemer (Galatians 4:5-7; Titus 2:14) and savior of the world (1 John 4:14). Jesus was always God’s redemptive plan for man’s salvation which was made before the foundation of the world (Ephesians 1:4). It was God’s plan alone that gave man this second opportunity to obtain “salvation” (which is eternal life with God the Father) made possible through the obedience of Jesus Christ (Hebrews 5:8; John 5:19, 8:28-29, 12:49-50, 15:10), being deemed an acceptable sacrifice, in that he was tempted but did not (without) sin (Hebrews 4:15; 2 Corinthians 5:21; 1 Peter 2:22; 1 John 3:5; ) and gave his life humbly as a “lamb of God” sacrifice (John 1:29, 4:42, 6:68-69; 1 Peter 1:19-20; Revelation 13:8). Here again, we need to first start at the beginning of this writing (Chapter 1) to prove that Paul is speaking about two different individuals. Here in (Titus 1:3-4) Paul clearly identifies and distinguishes God from Jesus yet they are both called by the same title “Saviour”. However, Paul calls God the Father and Jesus is called Christ (Christ is a title given to only one “man” and God is NEVER called or referred to as “the Christ”). Titus 1:3-4 (KJV) “But hath in due times manifested his word through preaching, which is committed unto me according to the commandment of God our Saviour; 4To Titus, mine own son after the common faith: Grace, mercy, and peace, from God the Father and the Lord Jesus Christ our Saviour“. I find that in (Titus Chp. 2 and 3) both God and Jesus are called Saviour apart from each other. Most of us as Christian believe in the judgment of man (Ecc 11:9, Ecc 12:14, John 5:26-29, Acts 17:31, Ro 14:9-12, 2Cor 5:10, 2Tim 4:1, Jude 1:15) based upon some sort of qualifying criteria to obtain salvation. Most base this criteria upon repentance, baptism and for some speaking in tongues is alleged to be mandatory. But is this an accurate understanding to hold. If such is being claimed as mandatory then what happens to other special case situations or individuals? Individuals, such as those who were either isolated (in the jungle or arctic) or remain set apart from civilization (primitive or natives)? What happens to those individuals who did not receive the opportunity to hear the word of God or obtain the foreknowledge of Christ before their death? Those who existed prior to the time of wide spread communication technology (TV or radio) or mass printing and distribution of the Bible? But more importantly what happens to those individuals who were (or are) mentally ill (handicapped) or infants who possibly died shortly after birth before even hearing the word of God? God didn’t exactly give us all of the answers “directly” to every possible scenario an individual may be confronted with, although that is not to say the correct answer is not contained within the Holy scriptures. There are those who hold firm that an individual must 1. Repent 2. Believe In Christ (death, burial, resurrection, being the Son of God, etc..) 3. Receive Baptism and 4. Speak in Tongues (for Tongue Believers) as being mandatory criteria’s for “everyone” and with no exceptions, um?. Some hold that Hell (Damnation) is the final destiny for any individual if these steps are not followed above. The problem with ministries who take scriptures out of context and then try to apply select scriptures literally to everyone that ever lived, would be to imply that it would also include all of the “special case” individuals and circumstances (such as the mentally handicapped or babies, etc…). Generally most Pentecostals (and others) who claim to be unwavering “Baptism by submersion only” and stringent “Speaking in Tongue Believers only” are sort of stuck holding this position, even though a baby cannot speak in tongues or repent let alone have the mental ability to confess or believe in Jesus Christ raising from the dead or even understand who Jesus Christ is (Lord) or his purpose. Babies have to be taught both to speak and understand right from wrong. I am also not aware of any religious group practicing full submersion under water of infants. God’s purpose for accountability and salvation was not to take advantage of those individuals who may be disadvantaged through no fault of their own, what kind of God would we be trying to make God out to be? We then would be making God out to be cruel. Do you then say that God is fair or unfair? Just or unjust? Your conclusion must take in every aspect of Gods character and make sure the scriptures you are quoting are interpreted correctly and fit jointly together in harmony. Somehow, it seems that somebody is leaving out one component of God’s character and that is God is Love (1John 4:1) and God has compassion for all of mankind, so much so that he gave his son so that ALL might have life (John 3:16) of which ALL includes “special case” individuals. Is God to be accused of being unfair? How dare we speak or even think such nonsense. Fortunately for some of us folk, God knew these issues existed and his word does provide evidence when such unfortunate circumstances are presented he has consideration in these special situations. God is wisdom, he just doesn’t haphazardly omit vital information necessary for one’s ability to receive salvation or unfairly jeopardize anyone due to disadvantages beyond their control. What may seem unfair and sound unreasonable is because it probably is. Therefore, we know that any unfair concept thinking surrounding God must be immediately discarded from even being considered as a possibility. To believe in a Holy God you must also believe God is JUST!!! Nothing occurs without God’s permission. They are either God Arranged or God Allowed (Exodus 4:11; Ecclesiastes 2:26). I first heard this phrase at a Christmas gathering one day and the truth of the saying stuck with me. I felt that it especially applies to those special case individuals and situations deaf, dumb, etc., (handicapped, babies, natives, etc..). Note: These passages indicate that a level of knowledge is required for damnation. (1 John 1:7-9) “But if we walk in the *light, as he is in the light, we have fellowship one with another, and the blood of Jesus Christ his Son cleanseth us from all sin. ……………If we confess our sins, he is faithful and just to **forgive us our sins, and to cleanse us from all unrighteousness. What was the purpose of Calvary? From the fall of Adam in the garden until the resurrection and ascension of Jesus Christ mankind was separated from God by sin. Through the obedience of Jesus Christ the law was not destroyed but fulfilled and God’s redemptive plan was completed ushering in grace. When grace was given, sin lost its dominion over mankind. Man was no longer subject to the law but to grace. But did this give men the golden ticket to do whatever pleased their flesh? God forbid. Previously man had free will facing the law and a system of sacrifices; now man had free will and grace and with that came the ability to choose his own master. Sin would still separate him from God; grace gave him an advocate before the Father to plead his cause and to be restored to right standing with God. Grace gave man redemption (it paid his debt for sin) and allowed him to walk away a free man. With that freedom the relationship was restored between the redeemed man and God. All relationships are built of two separate entities, (God/man, man/wife, mother/child, friend/friend, etc.). All healthy relationships have set and mutual boundaries. For example, a father is to train, love, nurture and discipline his child while a child is to love, obey and follow his father’s example. Two entities and appropriate boundaries make for a healthy relationship in which the father can excel in leadership and a child can excel to become a leader. Another example is a marriage. A husband is to lead, provide, be faithful and love his wife while a wife is to follow, lift up, and be faithful to her husband. The relationship between a father and child are permanent; formed through blood, human DNA or adoption, while a marriage is meant to be permanent based on a commitment established by choice. When boundaries are crossed the health of a relationship is compromised, when boundaries are destroyed some relationships cannot be restored. In the relationship we have with God, he is our father which means we have the boundaries that are similar to those of a child (to love, honor, obey, and imitate his character, etc.). When a child falls outside the lines of acceptable behavior they fall into disobedience and discipline happens. This is the natural course of events in a parent/child relationship. God too disciplines his children, and his redirection is targeted at bringing the child of God back into right standing or relationship with him. God’s goal was never cruelty or abuse. The discipline will be appropriate for the offense. Those that have greater understanding will be held to a higher standard. Just like an older child is able to be given more responsibility than a younger sibling. God, as our Father, desires for his children to be holy and above reproach, he wants us to even abstain from the appearance of evil (1Thessalonians 5:22). That is a higher standard than to just do right; it is to do right and not allow yourself to be associated with anything or anyone that could be perceived (whether rightly or wrongly), to be evil. For example, as a man or woman of God don’t allow yourself to be put into a situation that even looks wrong whether is or is not wrong. Abstain. God wrote his plan of redemption to include his son Jesus Christ. Jesus relinquished his human will and submitted himself to God’s plan. He took the bullet (the cross) for us, our wages would have cost our lives and he redeemed them through his obedience. (1John 2:2) And he is the propitiation for our sins: and not for ours only, but also for the sins of the whole world. (Hebrews 9:22-28) And almost all things are by the law purged with blood; and without shedding of blood is no remission. 23 It was therefore necessary that the patterns of things in the heavens should be purified with these; but the heavenly things themselves with better sacrifices than these. 24 For Christ is not entered into the holy places made with hands, which are the figures of the true; but into heaven itself, now to appear in the presence of God for us: 25 Nor yet that he should offer himself often, as the high priest entereth into the holy place every year with blood of others; 26 For then must he often have suffered since the foundation of the world: but now once in the end of the world hath he appeared to put away sin by the sacrifice of himself. 27 And as it is appointed unto men once to die, but after this the judgment: 28 So Christ was once offered to bear the sins of many; and unto them that look for him shall he appear the second time without sin unto salvation. (Hebrews 10:1-39) For the law having a shadow of good things to come, and not the very image of the things, can never with those sacrifices which they offered year by year continually make the comers thereunto perfect. 2 For then would they not have ceased to be offered? because that the worshippers once purged should have had no more conscience of sins. 3 But in those sacrifices there is a remembrance again made of sins every year. 4 For it is not possible that the blood of bulls and of goats should take away sins. 5 Wherefore when he cometh into the world, he saith, Sacrifice and offering thou wouldest not, but a body hast thou prepared me: 6 In burnt offerings and sacrifices for sin thou hast had no pleasure. 7 Then said I, Lo, I come (in the volume of the book it is written of me,) to do thy will, O God. 8 Above when he said, Sacrifice and offering and burnt offerings and offering for sin thou wouldest not, neither hadst pleasure therein; which are offered by the law; 9 Then said he, Lo, I come to do thy will, O God. He taketh away the first, that he may establish the second. 10 By the which will we are sanctified through the offering of the body of Jesus Christ once for all. 11 And every priest standeth daily ministering and offering oftentimes the same sacrifices, which can never take away sins: 12 But this man, after he had offered one sacrifice for sins for ever, sat down on the right hand of God; 13 From henceforth expecting till his enemies be made his footstool. 14 For by one offering he hath perfected for ever them that are sanctified. 15 Whereof the Holy Ghost also is a witness to us: for after that he had said before, 16 This is the covenant that I will make with them after those days, saith the Lord, I will put my laws into their hearts, and in their minds will I write them; 17 And their sins and iniquities will I remember no more. 18 Now where remission of these is, there is no more offering for sin. 19 Having therefore, brethren, boldness to enter into the holiest by the blood of Jesus, 20 By a new and living way, which he hath consecrated for us, through the veil, that is to say, his flesh; 21 And having an high priest over the house of God; 22 Let us draw near with a true heart in full assurance of faith, having our hearts sprinkled from an evil conscience, and our bodies washed with pure water. 23 Let us hold fast the profession of our faith without wavering; (for he is faithful that promised;) 24 And let us consider one another to provoke unto love and to good works: 25 Not forsaking the assembling of ourselves together, as the manner of some is; but exhorting one another: and so much the more, as ye see the day approaching. 26 For if we sin wilfully after that we have received the knowledge of the truth, there remaineth no more sacrifice for sins, 27 But a certain fearful looking for of judgment and fiery indignation, which shall devour the adversaries. 28 He that despised Moses’ law died without mercy under two or three witnesses: 29 Of how much sorer punishment, suppose ye, shall he be thought worthy, who hath trodden under foot the Son of God, and hath counted the blood of the covenant, wherewith he was sanctified, an unholy thing, and hath done despite unto the Spirit of grace? 30 For we know him that hath said, Vengeance belongeth unto me, I will recompense, saith the Lord. And again, The Lord shall judge his people. 31 It is a fearful thing to fall into the hands of the living God. 32 But call to remembrance the former days, in which, after ye were illuminated, ye endured a great fight of afflictions; 33 Partly, whilst ye were made a gazingstock both by reproaches and afflictions; and partly, whilst ye became companions of them that were so used. 34 For ye had compassion of me in my bonds, and took joyfully the spoiling of your goods, knowing in yourselves that ye have in heaven a better and an enduring substance. 35 Cast not away therefore your confidence, which hath great recompence of reward. 36 For ye have need of patience, that, after ye have done the will of God, ye might receive the promise. 37 For yet a little while, and he that shall come will come, and will not tarry. 38 Now the just shall live by faith: but if any man draw back, my soul shall have no pleasure in him. 39 But we are not of them who draw back unto perdition; but of them that believe to the saving of the soul. That is why it is imperative to read and study the Word of God (Your Bible) for ourselves, so we know exactly what God considers sin and instill that knowledge into our children. We should want to understand and know what God desires of us and for us. A sin is NOT an accident. A person cannot commit a sin “by accident.” Sinning is a willful act. The Bible says, “Therefore, to him that knoweth to do good, and doeth it not, to him it is sin” (James 4:17). If a person doesn’t know what they are doing is wrong, it is not a sin to them. A person has to know the right (good) thing to do, and then choose not to do it, in order to sin. A sin is NOT a mistake. A mistake is NOT a sin. A mistake is an error that is committed accidentally. A sin is a willful act of disobeying God. A sin is NOT a fault. A fault is NOT a sin. A sin is a willful act of disobeying God. A fault is a flaw or weakness. Now that we understand what sin is we can better understand other topics as they relate to sin. 14. Will We Know Our Loved Ones in Heaven? Will we be able to recognize our friends, loved ones, and others in heaven? Before addressing this question with scripture, I would like for us to just take a minute and think whether or not having the same human emotional feelings (which is inclusive of every emotion; hatred, anger, love, etc. ), such as we now experience here on earth today, would actually be a good thing for saints to possess in Heaven. Pondering the thought of seeing our loved ones in Heaven with us may at first seem pleasing, but how would you feel if a loved one didn’t make it to Heaven? Have you ever wondered, what if I am not successful in helping to save all my family members? How will I be able to enjoy heaven if those I love now will not be with me and will be suffering for eternity? When you are born into a family, special bonds are established as we develop. Besides our natural family, however, we have another family if we are born again. God becomes our Father and every other believer is our brother or sister. I have a feeling that our spiritual bonds (our spiritual family) will be much stronger and deeper than those bonds we had with our natural family. According to scripture, it appears that our natural family ties will be loosed at death and replaced (changed) with our new spiritual family ties with God and Christ (Ro 8:11, 16-17, 1Cor 15:51, 1John 3:2). If that is the case, the removal of the family ties we held on earth would free us from grief or missing anyone not in heaven with us (Isa 65:17, Rev 21:4). We cannot imagine that happening but we have not yet known and felt and seen what it will be like in eternity. From scripture we are certain that we will no longer be under the curse of sin, death, disease. We know that God will wipe away every tear. Paul said; “No eye has seen, no ear has heard, no mind has conceived what God has prepared for those who love him.” (1 Corinthians 2:9) One thing is for sure, we can trust that God has this problem worked out. 2Pe 3:10-13 — But the day of the Lord will come as a thief in the night; in the which the heavens shall pass away with a great noise, and the elements shall melt with fervent heat, the earth also and the works that are therein shall be burned up. 11 Seeing then that all these things shall be dissolved, what manner of persons ought ye to be in all holy conversation and godliness, 12 Looking for and hasting unto the coming of the day of God, wherein the heavens being on fire shall be dissolved, and the elements shall melt with fervent heat? 13 Nevertheless we, according to his promise, look for new heavens and a new earth, wherein dwelleth righteousness. Rev 21:1-5 — And I saw a new heaven and a new earth: for the first heaven and the first earth were passed away; and there was no more sea. 2 And I John saw the holy city, new Jerusalem, coming down from God out of heaven, prepared as a bride adorned for her husband. 3 And I heard a great voice out of heaven saying, Behold, the tabernacle of God is with men, and he will dwell with them, and they shall be his people, and God himself shall be with them, and be their God. 4 And God shall wipe away all tears from their eyes; and there shall be no more death, neither sorrow, nor crying, neither shall there be any more pain: for the former things are passed away. 5 And he that sat upon the throne said, Behold, I make all things new. And he said unto me, Write: for these words are true and faithful. 15. Why Must I Confess My Sins If I’m Already Forgiven? Why Must I Confess My Sins? Sin is the key word in this statement. If you have no sin in your life, there is no need for confession! The purpose of confession is to indicate that we are assuming responsibility for our actions. We are not blaming our actions on others. Confession means that we see ourselves in relationship to our deeds of sin just like God does. All sin is against God, it is destructive to His purpose for our lives, and it carries with it consequences that will prove painful (Mat 25:46, John 5:29, Rom 6:23). The Bible tells us that if we sin wilfully after that we have received the knowledge of the truth, there remains no more sacrifice for sins (Heb 10:26). This is just one aspect of why God’s grace is so vitally important. It is because God’s grace allows room for forgiveness to be administered through confession; “If we confess our sins, He is faithful and righteous to forgive us our sins and to cleanse us from all unrighteousness” (1 John 1:9). (Romans 8:1) There is therefore now no condemnation for those who are in Christ Jesus. Forgiven sins have no condemnation consequences! However, if we fail to rightly divide the word of God it would appear to be impossible. Consider what the Bible tells us about Salvation, in “select” passages. According to the Bible there are several required steps necessary for all sinners, if we were to take every scripture literally. This however would create several immediate problems for many of the Old Testament Saints. We are told by Peter that a person should BELIEVE in Jesus Christ and be baptized in the name of Jesus (Acts 2:38). Jesus said, “He who believes and is baptized will be saved; but he who does not believe will be condemned” (Mark 16:16). How would the Old Testament Saints come to believe in Jesus as the Son of God (1John 5:5)? It is by hearing the Word of God. “So then faith comes by hearing, and hearing by the word of God” (Romans 10:17). Therefore, a person should have faith in Christ, who we know did not exist during this time period (being the seed of David- yet to be born by Mary, who was yet to be born herself), if in fact Jesus was indeed a real “human being” and the true blood offspring (descendant) of David (not just the outward appearance of a human). It is stated that a person should also CONFESS his faith in Christ. (Romans 10:9-10) “If you confess with your mouth the Lord Jesus and believe in your heart that God has raised Him from the dead, you will be saved. For with the heart one believes unto righteousness, and with the mouth confession is made unto salvation.” Here again, we are presented with another apparent impossibility, as Jesus had not yet been born, crucified or resurrected from the Dead. A person is to REPENT of their sins and be baptized. It becomes clear that the criteria for the Old Testament Saints were not totally the same prior to Christ. Yet we know that there are those who the Bible characterizes as Holy men of God (2Peter 1:21). Many of whom were obedient, righteous and faithful to the will of God (Mat 25:46, Luke 1:6), which as we all know is a good thing. Because everyone will be judged (John 5:29, Acts 24:15), and everyone (including the Old Testament Saints) will stand before the judgment seat of Jesus Christ (John 5:22, Acts 17:31, Romans 2:16, 14:10, 2Cor 5:10, 2Tim 4:1) and this fulfills the truth Jesus speaks of. Many preachers today say, “You must pray the sinner’s prayer and invite the Lord Jesus into you heart.” But no one in the Bible was ever told to do that. In fact, Paul prayed after Jesus spoke to him on the road to Damascus (Acts 9:3-6 NIV, Acts 9:11 NIV) and yet Paul was still in his sins when Ananias met him three days later (Acts 22:16). Cornelius prayed to God always (Acts 10:2), and yet there remained something he still had to do after calling for Peter (Acts 10:6). You must confess that Jesus Christ is the Son of God (Romans 10:9-10). We are to make Jesus “Lord” of our life (master/obey him) because God has made Jesus our Lord (Acts 2:36). As with faith and repentance, confession alone does not save (Matthew 7:21). Having believed, repented, and confessed that Jesus is the Son of God, you must be baptized for the remission of your sins (Acts 2:38). It is impossible to proclaim the gospel of Jesus Christ without teaching the importance of baptism for salvation (Acts 8:35-36; Romans 6:3-4; 1 Peter 3:21). Anyone who responds to the question in Acts 2:37 with an answer that contradicts Acts 2:38 is NOT proclaiming the gospel of Jesus Christ! Once you are saved, God adds you to his church and writes your name in the Book of Life (Acts 2:47; Philippians 4:3). To continue in God’s grace, you must continue to serve God faithfully until death. Unless they remain faithful, those who are in God’s grace will fall from grace, and those whose names are in the Book of Life will have their names blotted out of that book (Revelation 2:10; Revelation 3:5; Galatians 5:4). 18. Is the Kingdom of Heaven and the Kingdom of God the Same? The terms kingdom of God and kingdom of heaven are synonymous. When Jesus was speaking to the rich young ruler, Christ uses “kingdom of heaven” and “kingdom of God” interchangeably. “Then Jesus said to his disciples, ‘I tell you the truth, it is hard for a rich man to enter the kingdom of heaven’” (Matthew 19:23). In the very next verse, Christ proclaims, “Again I tell you, it is easier for a camel to go through the eye of a needle than for a rich man to enter the kingdom of God” (verse 24). Jesus makes no distinction between the two terms but seems to consider them synonymous. Israel rejected the Lord Jesus Christ as the Messiah when He first came because the religious rulers of Israel were only looking for a political Messiah King who would make Israel the ruling kingdom of the world (See Jeremiah 23:5, Luke 1:32-33). But they were blind to their need for spiritual deliverance and the true righteousness of God, which must be born into the heart. Note: It is, however, this particular passage (a metaphoric passage) that has caused confusion for many who try and take it literally. Depending on the context, the Bible speaks of heaven (the Kingdom of God) as two different locations, within and above. This, however, should present no confusion once we understand that having Heaven within you is a metaphor, the righteous who have access to the Kingdom of God (Heaven) through the Spirit of God, (called the Holy Ghost), but it is certainly not speaking of the literal complete dimension, habitat, or realm of God’s Kingdom, where His angels reside (angels don’t reside or live within you literally). God’s Kingdom, which Christ is a part of, is not of this world. Note: This occurred when John had a vision, or revelation (Rev 1:1), of a prophecy (Rev 1:3) given him from an angel pertaining to the Kingdom of God (Rev 1:4-6, 12:10). John wasn’t talking about things he saw literally inside his body. 1Cor 15:50 Now this I say, brethren, that flesh, and blood cannot inherit the kingdom of God; neither doth corruption inherit incorruption. 20. Saved By Grace – What Does That Mean? We All Must Meet God’s Standard To Enter Heaven: Because There is a Judgment Day Were Each Individual Will Be Held Accountable. God’s Grace: made salvation available, Obedience determines its reality. 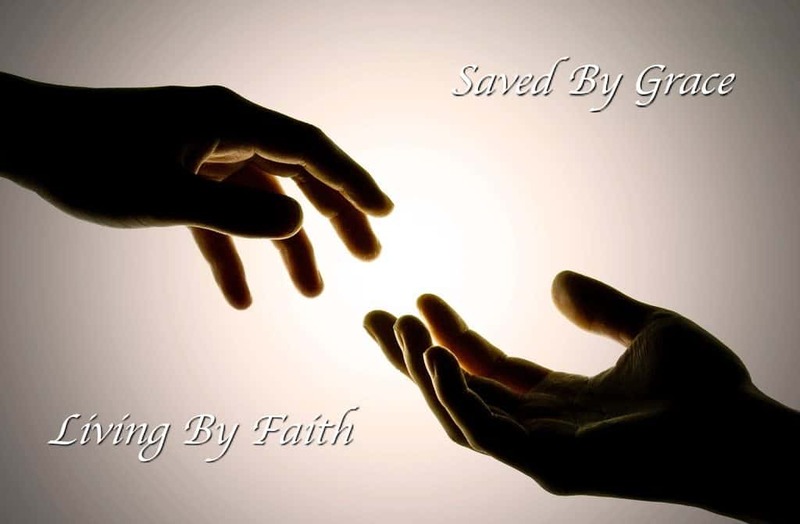 ♦ Faith (In God’s Grace) Without Works (Not Living Holy) is Dead (No Salvation)! 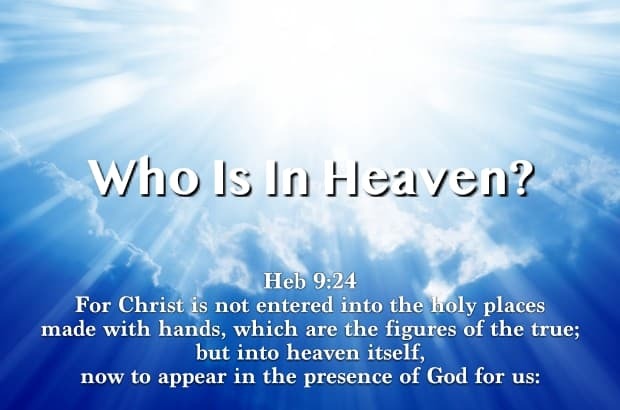 “And as it is appointed unto men once to die, but after this the judgment:” (Heb 9:7) According to this passage, everyone dies, but not everyone goes to heaven. God is holy and perfect. Heaven, His dwelling place, is holy and perfect. It should come as no surprise that the Word of God tells us that we are to be perfect as our Father who is in Heaven is perfect (Matt 5:48). In many ways, this life is a time of testing—because our actions in this life determine our eternal destiny, Heaven or Hell. Important Note: That Is Fake News! The finished work of Christ ONLY pertains to the foretold DEATH of Christ (Luke 18:31-34, John 19:28, Acts 13:29), Christ gave his life as a sacrifice for our sins (1Cor 15:3). The fulfillment of God’s purpose in Christ is not only wrapped up in his birth, death, and resurrection but also the return of Christ to “put down all his enemies” (1Cor 15:24-25 NIV). Until such time, the promise of our salvation remains dependant on our obedience and the unfinished work of Christ (1Cor 15:24-28 NIV). 1) We find in Isaiah several promises (Isaiah 9:7 ) yet to be fulfilled, One was that he shall carry the government upon his shoulders (establish it – verse 7). Jesus never formed or ruled a government from the throne of David, which is to be given him by God (that did not occur then, nor today). Isaiah 9:7 – Of the increase of his government and peace there shall be no end, upon the throne of David, and upon his kingdom, to order it, and to establish it with judgment and with justice from henceforth even for ever. The zeal of the Lord (H3068) [Yahweh, Jehovah] God of hosts will perform this. 2) The last major verifiable promise says that there is to be world peace forever (no end), which certainly does not exist at this time. It is said that we are living in the “Grace Dispensation Period” (Ephesians 3:2, 5-6), which is true, however, that does not mean that everybody (especially sinners, the wicked, etc..) will be going to heaven nor does it somehow support this new “Once Saved Always Saved” concept, which is primarily premised off of two other grace related scriptures (Ephesians 2:8 and 2 Timothy 1:9). So let’s explore what Paul is actually telling us in writing to the church of Ephesus and in his letter to Timothy. Whenever we have a discussion about the meaning of any scripture, it is always a good idea to present your understanding of those particular words which you have come to rely on in support of your doctrinal position. This can often identify and correct any potential error or misunderstanding. In these two passages (Ephesians 2:8; 2 Timothy 1:9) we find four words that are of great significance. They are grace, faith, work, saved. When we reference the word “grace” in these particular two passages (Ephesians 2:8 and 2 Timothy 1:9) it is made clear that it is “God’s grace” that we are referring to (1Peter 5:10). Whenever we reference the word “saved” in these two particular passages (Ephesians 2:8 and 2 Timothy 1:9), it is with the understanding that it is “God’s plan of salvation” (eternal life/immortality) that we are referring to and not that of any other being. There must also be Scripture that supports this understanding (John 12:49-50, 1Th 5:9, 2Th 2:13, Titus 2:11, Rev 5:12, 13:8). God’s Grace – made salvation available to man, what that actually means can be broken down even further. God extending his grace upon man meant that blood sacrifice would no longer be required for the remittance of sins (Hebrews 9:22) – Christ would be the last and only sacrifice required by God from this point forward (Hebrews 9:24-28). Note: This is vital because you must first have faith that God exists and His promises will be kept. That there is a heaven and that there is a resurrection unto eternal life. And because we have an example given us in Christ, witnessed by the apostles and others, that God raised him from the dead and he ascended up into heaven to sit at the right hand of God (Eph 1:20, 1Peter 1:21) our faith is strengthened. Faith and grace operate in conjunction with each other. When we speak of grace we are speaking of faith also, because it is our faith that we put our trust in the grace of God. What many may not realize is the fact that faith and grace are actually the resulting by-products that come from work and obedience. Faith (Grace) w/o Work (Obedience) is Dead. Note: When we are given instructions to obey a command it indicates that some type of action must be taken in response to the instructions/command given, so as to be in compliance (reflecting your act of obedience). Your obedience ensures that your salvation becomes a reality. God doesn’t give you salvation just because you exist. There is work that you are required to perform. Diligently – is also an action word, it implies the act of pursuing something you want to obtain or achieve (Your Salvation). You don’t just receive the Holy Ghost and say; “that’s it, I have no more work required of me,” wrong. We will always be tempted to sin while in the flesh. Therefore, to live Holy (or sinless) requires deliberate thought and action on our part to refrain from sin. To refrain is to resist and resistance is a form of work. God’s standard to enter into heaven is perfection. God’s standard never falls short of complete righteousness and holiness. Anything less than perfection is sin. Think about heaven for a moment. Heaven is a place of the “no more’s” – no more tears, no more sadness, no more pain, no more sickness, no more death. All of those things are caused by sin. The “no more’s” don’t exist in heaven because sin does not exist in heaven. Heaven will be wonderful, not only because God will be there, but also because of what will not be there – sin. Therefore SINNERS will not be in heaven! Is God’s Standard Of Perfection Even Attainable? – YES! When God tells us that we are to be “holy,” “perfect,” “without blemish,” spot, wrinkle, any such things (Eph 4:12-13, 5:27; Col 1:28; 1Peter 1:15-16) we are bound to believe that His command can be obeyed, and we ought not to be satisfied until we make God’s command an actuality. Jesus went to Heaven because he met God’s standard (John 8:28-29, 12:49-50) – Jesus was our example. One of the saddest hindrances that any teacher or pastor could do is lead people to suppose that God’s purpose cannot be accomplished. Does God command us to do what is impossible? No! The LIE, which Satan tries to instill in man, is that it is impossible to live such a victorious life (Jude 1:24-25; 2Peter 2:4-6, 9). 21. Is There A Difference Between Being Saved & Receiving Salvation? Is there a Difference between being Saved and Receiving Salvation? Saved – Reflects your current state or current condition at that moment in time. Salvation -Reflects something that you obtain that is permanent – for a Christian, it is your goal/objective. We may be saved, yet we are still seeking salvation. Although these two grouping of words, within themselves, have similar meanings (saved and salvation) there is a difference. Saved – can mean to be delivered from, or rescued from something, someone or from someplace, circumstance or condition. It can be compared to the difference between you saying that you stopped doing something versus you making the claim you quit doing something. I’m sure there is someone who has probably used this line to discredit the obvious fact that they are drug addicts or alcoholics. They may say that I’m just a social user, social drinker, I don’t have to have a drink, I only drink on the weekends, I only smoke when I have a drink, etc. etc. My Bible tells me that it is the little foxes that destroyed the vine. To be saved is a process, (a never-ending process until we die). You can be saved today and headed to hell tomorrow. To have salvation is the completion of the being “saved” process. It is your final destination, it is heaven “with God,” and it is the “with God” that is the pivotal difference when we speak of Heaven. It is the final state of condition where we now obtain immortality, which in turn means that you cannot die again, and although we say we really want to be up there with God and Jesus and see everybody else in heaven, the bottom line is we value the thought of never dying again, never experiencing any more pain, any more sorrow, all of those promises that we would obtain for trusting in Christ and believing God (1John 2:17, Rev 7:17, 21:4-7, 22:3).